How to AirPlay with Beamer? Although it may be quite handy for you to directly stream movies and music from Mac to Apple-TV with a built-in iOS (4.2 or newer) AirPlay feature or a native OS X (Mountain Lion or later) AirPlay mirroring feature, Beamer is capable of drawing much more attention by just focusing on one thing in particular –AirPlay video from Mac to Apple-TV, in the best audio and video quality possible. And as Mac Stories commented –"Beamer does one thing and it does it extremely well!" With high rendering ability to AirPlay and playback UHD 4K 8K videos, 5KPlayer is one of the best alternatives to Beamer to AirPlay videos from PC/Mac to Apple TV 4/3. It also has support for 7.1 surround sound and reads almost all popular video/image formats and codecs. Free download 5KPlayer now! 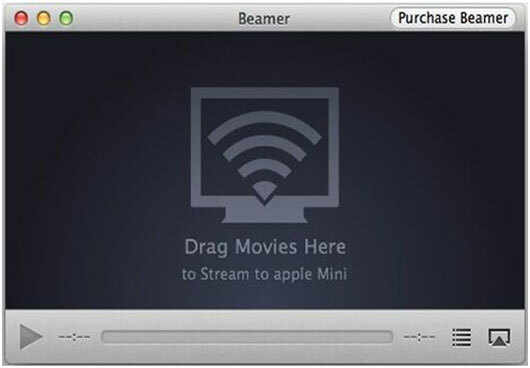 How to Use Beamer to Airplay Videos from Mac to Apple TV? With high playback quality in regard of image (full HD support) & sound (5.1 surround sound) and support for almost all common formats and codecs, Beamer is an easy and the quickest solution for you to AirPlay video from Mac to Apple TV, as it works just like a regular media player but the video plays on Apple-TV. How to AirPlay with Beamer to stream videos from Mac to Apple TV? Forget all the limitations you know about AirPlay on the Mac! To realize Beamer AirPlay video, all you need to do is to download the Beamer and drag a video onto the interface for AirPlay. The Beamer will automatically detect the AirPlay receivers, and you can select the target receiver in the popup menu by clicking the AirPlay icon at the lower-right corner. The Beamer new 2.0 version also creates playlists to queue up a bunch of videos for watching in succession. Beamer also remembers what you have watched and at what point in the video you stopped watching. Requires Apple TV and OS X Mavericks (10.9) or Yosemite (10.10). Only support one-way AirPlay: from Mac to Apple-TV. No video or audio online resources support. However, chances are that if your Mac system is OS X Mountain Lion or older, or if you want to AirPlay from Mac to Mac/PC or iDevices (iPhone SE/iPad pro) to Mac/PC, or if you want to AirPlay music from Pandora, this Beamer might be useless and you may find yourself at sea trying to fish another powerful Third-party App for smooth and seamless AirPlay playback quality. Here, we recommend you a robust free alternative to Beamer AirPlay –5KPlayer. As a great Ultra HD video-music player, 5KPlayer plays any audio video files including AVI, MKV, MOV, MP4, WMV, FLV. It is also a free online A/V downloader that downloads videos and albums of music from over 300 online websites like YouTube and Spotify, and a free radio player that brings any online radios within your ears' reach. 5KPlayer is equipped with all the features that a professional media player supposed to possess and much more. Support AirPlay from Mac to Mac, Mac to Apple TV and iDevices (iPhone/iPad/iPod Touch) to Mac. Accepts almost all A/V formats, codecs. b. Supports 5.1 Surround Sound and Even Higher (7.1). 4. Supporting Airplay-Enabled Third Party APPs: Spotify, Pandora etc..
5. Creating playlist for all AirPlay files. How to AirPlay from iPhone to Mac with Beamer AirPlay Alternative? Step 1: Download this free Beamer alternative for AirPlay-5KPlayer (Mac version) on Mac, then launch it. Note: Your iPhone and Mac should be connected the same WiFi network before AirPlay. Step 2:Go to Control Center on the display of your iPhone (6/SE) and find AirPlay. Click AirPlay. Then you can see a list of AirPlay receiver options, and select your Mac. Step 3: Select a video to be streamed by this free Beamer alternative from iPhone to Mac. Then 5KPlayer will start playing and streaming. The whole process of streaming is quick with not a bit loss in quality, and in the mean time, you are free to do other things on your Mac, like online shopping and browsing news. Note: As AirPlay only supports videos in MP4, M4V, MOV format and music in MP3, M4A and AAC format, you may need an efficient DVD video converter software for Mac OS to convert your films into target formats first. 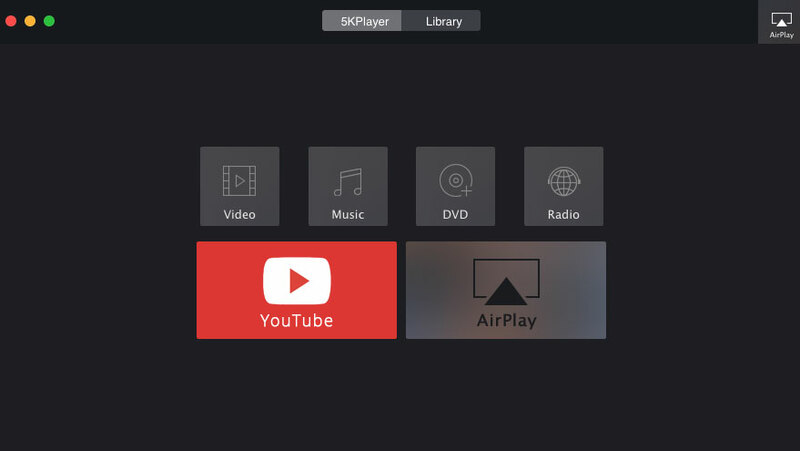 Apart from being a free Beamer alternative for AirPlay, 5KPlayer is also a powerful media server that has access to vast online A/V resources for us to download online video music and can provide playback customization. Exactly as the world welcomes the multi-disciplinary talents, we welcome software of versatility that basically caters for our all-round demands in a particular field. 5KPlayer aims to make itself a powerful and cover-all media player that brings convenience and flexibility for us all. Therefore, to coin a phrase: In 5KPlayer we trust. Here's the easiest PC to TV wireless solution to help you stream Windows PC to TV withou choke. Learn how to AirPlay iPad to PC free, set up film streaming iPad to Windows PC to watch 720p, 1080p, 4K UHD videos on PC.